Soonhan Engineering Company announced that one of its top tier Flat Panel Display (FPD) customers has chosen SynqNet™ as its next generation motion control platform. 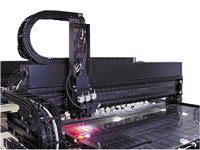 The large area gantry was designed by Soonhan to satisfy next generation requirements in the fast moving FPD industry. The linear motor gantry was designed for pattern inspection and provides a very large workspace envelope and a high level of motion accuracy. Because of tight performance specifi cations and the overall size of the equipment, SynqNet was selected as the best-in-class solution. Log in or Register to access the full article.